Nestled in the bend of the Brokenhead River at the very end of a country road is a small Christian community trying to live responsibly and faithfully. Four family units are shareholders of this 58-hectare piece of land that was formerly a commercial strawberry farm. Ploughshares Community Farm was incorporated in 2006, one of the many steps in a long journey that began more than seven years ago when a “seed group” of Winnipeg’s Grain of Wheat Church Community began to study The Economics of Love. Soon they were discussing food issues and then specific rural issues. Eventually, several of them decided it was time to put their energy and resources into what they had discussed and studied. “It’s difficult to know how to step out of the structures without having some control of capital and resources like land and water,” says David Braun, who, together with his partner Ruth Maendel, moved on to the community farm in 2007. 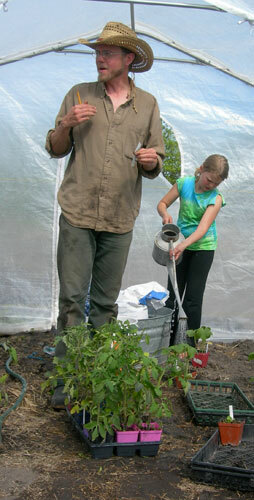 Marcus Rempel, his wife Jennifer Nast-Kolb and their two young daughters moved to the farm in May 2010. The other household consists of Rachel Braun and her 10-year old son, Ethan, who, together with Braun and Mandel, have living quarters on the second floor of the house. Rempel and Nast-Kolb live in a more primitive house on the property. Rempel has taken major responsibility for a large garden that will produce food for the four family units throughout the year. Some of the food will go to farmers markets, giving Rempel some income. Two young pigs happily root about nearby, unaware of their destiny this fall. 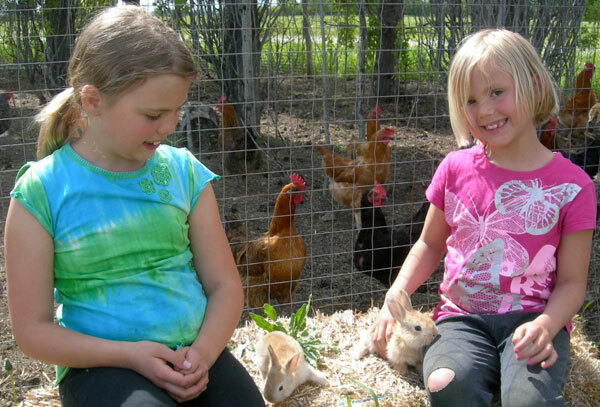 Sophia and Johanna Nast-Kolb are busy raising rabbits for the community and for sale. Maendel owns a flock of laying hens. The eggs feed the community and the extra eggs are sold for profit for Maendel. Wiens and Redekopp raise a flock of pastured broiler chickens and Wiens manages the field crops with support from Braun, who is planning to start a small herd of milking goats that will help to feed the community. Grazing cattle is part of the long-term plan. The community is grateful that most of them have work in the Beausejour area. 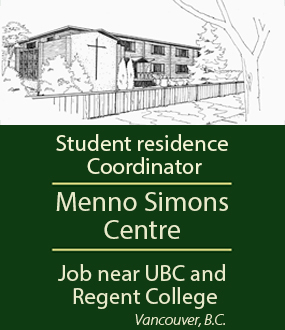 Braun works full-time as a social worker, Wiens works for the provincial agriculture department, Nast-Kolb works part-time as a massage therapist, and Rachel Braun is a full-time teacher. “Many of the farm expenses are shared and paid out of a corporate/joint bank account, but each family takes responsibility for their own finances,” explains Redekopp. “We formed the corporation, which owns all the land and buildings, and we each pay rent to offset the mortgage payments,” Rempel adds. They have at times worshipped together, and both Rempel’s and Wiens’s families have connected with the Anglican church in town. There is a gentleness and humility in their approach to this new lifestyle. Many Christians are involved in a personal search for authenticity and for a more faithful response to the issues of injustice and affluence, but these families are seeking to do it together in a rural setting.